In fall of 2018, the City enlisted some new helpers to battle buckthorn - goats! City council approved a three year pilot project in a two acre area at Civic Center Park to see if goats, along with other techniques, can help control buckthorn in savanna restoration projects. Large buckthorn and weedy trees were already removed from the pilot project area prior to the goats arriving. Following buckthorn removal, the area was seeded with native grasses. The goats were first brought in for a few weeks during fall 2018 to eat the smaller buckthorn saplings, reducing the need for herbicides. The grazing process will be repeated several times over the three year pilot project window. Over time, the goal is to weaken buckthorn and and other undesirable plants through grazing and allow more desirable species to take over. The goats are NO LONGER on site. The goats are expected to return in mid to late May to repeat the grazing process. They will likely stay for several weeks. The exact arrival date of the goats will depend on a number of factors and can't be guaranteed. Where do the goats come from and how long will they stay? The goats are owned by a company called Goat Dispatch. They specialize in goats that can be "hired" for invasive species control and land management. The goats will not permanently be at the park. They will stay for several weeks, with the exact timing dependent on how quickly they eat through the buckthorn in the project area. Which park will the goats be at? The goats will be at Civic Center Park. Take a closer look at the project area. Can I pet or feed the goats? The goats will be here to work so although we encourage you to stop by to see them, please do not try to pet or feed them. How do you keep the goats in the area that you want them? The goats are contained by two rows of temporary, easy to install fencing. The inner row of fencing is energized by solar power and 12-volt battery. The energized fence is low voltage and low risk for people. The outer row of fencing keeps people away from the goats and away from the energized fence. Signs on the fencing will notify park users about the project. Can I use goats on my Burnsville property? 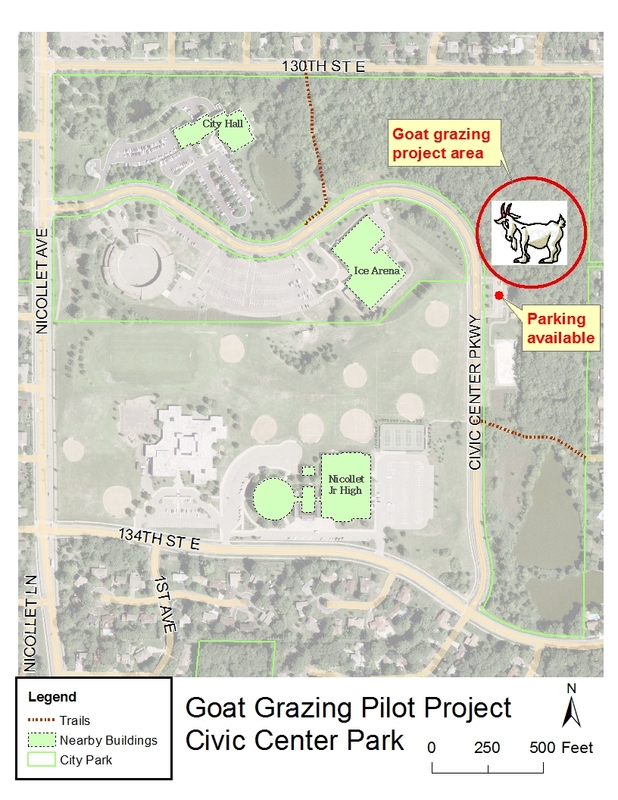 Prescribed grazing with goats is allowed (Title 6, Chapter 2 Section 21 of City code) within Burnsville but there are specific limitations on parcel size and numerous other factors. In general, a property must be at least half an acre (0.5) in size or larger in order for prescribed grazing to be allowed. Prescribed grazing must be conducted by a contractor who has been permitted by the City. Contractors must meet City insurance requirements. Further rules on prescribed grazing are outlined in the City's prescribed grazing policy which can be viewed here. Contractors interested in applying for a prescribed grazing permit can contact the City natural resources department at caleb.ashling@burnsvillemn.gov or 952-895-4543. Does anyone check on the goats? The contractor will check on the goats daily to make sure they have everything they need. Do the goats kill the buckthorn? 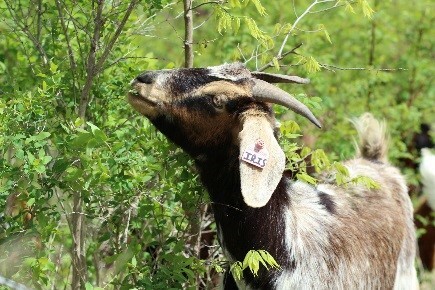 Goat grazing does not immediately kill the buckthorn. The goats damage the plants and cause them to resprout from the ground, wasting their root energy. Over time, this can kill the buckthorn. Goat grazing is most effective when repeated for several years and when used along with other management techniques.